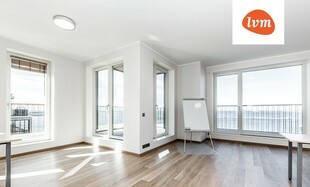 For rent office with private terrace at unique Noblessner campus. This office is located on the top floor and has stunning views over Tallinn bay. Thanks to large windows the rooms are spacious, well-lit and have access to the terrace. Size of the terrace is 39,8 m2. Building is modern, energy efficient and soundproof with smart home solutions, meaning that electricity consumption, heating and ventilation can all be controlled from your smartphone. The whole Noblessner campus will be consisting of apartments, offices and sales areas in addition to yacht harbour, promenade, green areas and numerous cafes with restaurants. There is a parking level in the building. Parking spots are rented for additional fee. According to Building Registry (www.ehr.ee) this house has level B energy efficiency. In addition to the monthly rent tenant will have to pay for utilities and VAT. Upon signal tenant is ought to pay the first month’s rent, security deposit in the amount of one month’s rent and a one-time brokerage fee in the amount of one month’s rent plus VAT. The office is waiting for you!